Picked up collards, cabbage, Swiss chard, and leaf lettuce plants at Home Depot last week. It’s time to plant my cold weather container gardens. Until these vegetables are ready to harvest, I’m relying on farmers’ market buys to round out our dinner menus. A medium size cushaw will serve from 6 to 8. Baked cushaw can be assembled the night before and refrigerated until ready to bake and enjoy. My recent favorite fresh vegetable discovery was a cushaw. 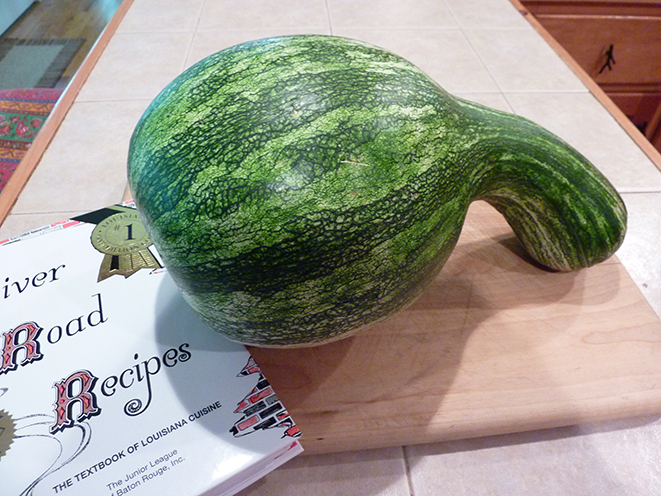 It’s a big striped squash, which can be baked in pies and casseroles. If you can find a cushaw do so now. Depending on the size, you may end up with a lot of leftover cushaw. No problem, baked cushaw can be frozen to enjoy at a later date. Honestly, cold baked cushaw is even tasty at breakfast. Hopefully you can find a cushaw and enjoy cooking and eating it as much as I did. Serves 6 to 8. Adapted recipe is from “River Road Recipes” published by The Junior League of Baton Rouge. Wash the outside of the cushaw thoroughly. Cut into large chunks leaving the peel on but removing seeds and as much stringy pulp as possible. Place in a large baking pan flesh side down. Add water to the pan until depth is about ½-inch. Cover pan of cushaw with foil and bake at 375 degrees for about 45 minutes or until the cushaw can be easily pierced with a fork. Remove from oven and cool. Drain cushaw and using a spoon separate the soft squash flesh from the peel and place in a large bowl. Discard the peel. You may need to drain off a little liquid from the squash before adding the rest of the ingredients. Mix in rest of ingredients with a mixer. Beat until smooth. Pour into a greased 8-inch square glass baking dish (or larger dish if you used a larger cushaw) and bake at 350 degrees until browned on top. Serve warm as a side dish with poultry or pork.